We received a call from a new customer in Bellingham. He was frantic. While working in his yard he stumbled across a bald faced hornets nest, and when I say stumbled, I mean he ran into it with his weed-wacker, immediately caused them all to come out of the nest and attack. John dropped the weed-wacker and ran leaving the weed-wacker to become a new lawn ornament. We were able to get right over, treat and remove the nest safely and ensure they did not rebuild. Actually, Bald Faced Hornets are not even hornets at all, they are in the Yellow Jacket family. They got their name from the ivory markings on their face. Bald Faced Hornets range in size from 1/2 to 3/4 inch. The queen is usually the largest yellow jacket in the colony. 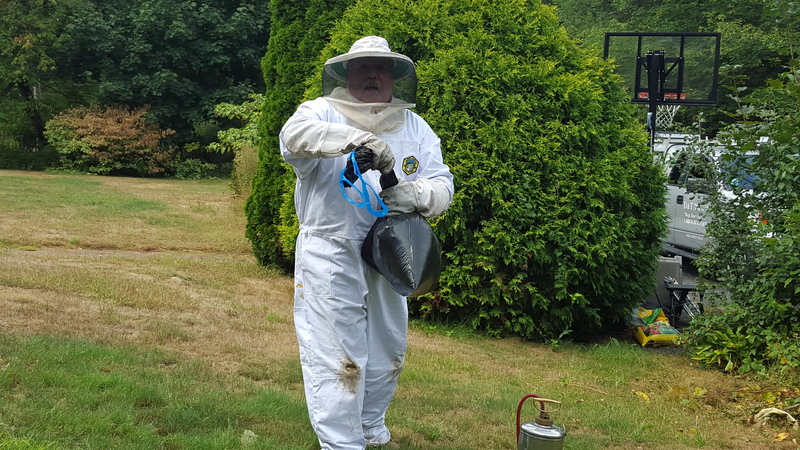 Bald faced hornets are very protective of their nest and will sting when threatened, which is exactly what happened to our customer in Bellingham. He was out working in his yard when he and his weed-wacker stumbled across a very large nest. The yellow jacket felt immediately threatened and they swarmed both our customer and his weed-wacker. Luckily, John was able to escape with only 2 stings. A bald faced hornet’s sting can be very painful. If he had endured anymore stings it could have ended him in the hospital. John may not agree with this, but alot consider bald faced hornets to be beneficial. Although having a nest near by can be rather intimidating, they actually eat many pests and insects that are also undesirable, such as his cousin the yellow jacket. On an average, a bald faced hornets nest can number between 200-400 hornets. Their nests are made from carton which is derived from chewed slivers of wood or wood pulp. D & T Pest Control strongly recommend leaving this kind of treatment to the professionals. Bald faced hornets like yellow jackets can be very aggressive when threatened.